Make the omelettes one at a time. Mix one egg in a bowl, beat with a fork, add seasoning and herbs (if using). Heat the oil in pan about 15cm in diameter. Add the egg and tilt the pan so the egg covers the whole base of the pan, cook for about 45 seconds, then remove the omelette while the top’s still soft. 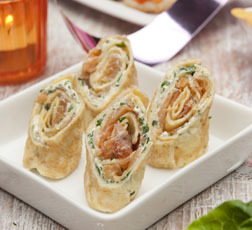 Arrange the chosen fillings (see below) over 2/3 of the omelette and roll up tight, starting from the filling end and ending at the empty omelette end to create a long barrel. Wrap tightly in cling film and chill in the fridge overnight. This will ensure the filling stays tightly within the omelette. To serve: unwrap the parcels and using a sharp knife, cut the rolled omelette into 3 cm barrels. Arrange on a serving plate.